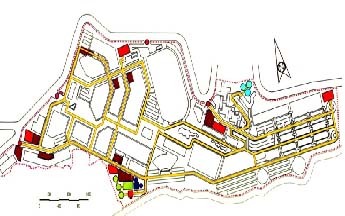 Based on the established physical Master Plan for the Beirut University College (Presently the Lebanese American University - LAU) new Byblos Campus, the project entailed the detailed design of all infrastructure and external works pertaining to the proposed campus and covering a gross area of 10 hectares. The study included detailed design of all landscaping components, roads and other circulation networks, infrastructure corridors, drainage, water distribution, sewerage, electrical, security and telecommunications networks. The project also involved the design of all ancillary support facilities including deep-wells, elevated water reservoirs and a sewerage treatment plant. The development of a cut-&-fill program to accommodate the proposed program of facilities and circulation networks, taking into consideration and making best use of the extensive sloping nature of the terrain. Development and establishment of an overall landscaping theme for the Campus. Comprehensive project management and implementation guidelines in order to insure that subsequent implementation packages shall proceed in an orderly manner with minimal disruptions to the daily normal operation of the Campus. Master planning, conceptual and detailed design. Tendering, supervision and project management of Phase 1 implementation packages.